Now for those of you who know me will know I have a bit of a soft spot for Jack Russells, quite a few years ago I had my own, Bouncer, he was a terribly cheeky chappy but unfortunately we lost him when he was only 4. They are one of those breeds that have such character and Penny here is no different. Glyn, Penny's Dad, asked me to paint her as a present for his wife, Liz, for Christmas. Liz works for Margaret Green animal rescue who I have done a lot with over the last year, not only attending their events with my work but also rescued the amazing Ned last August, our Sprocker Spaniel. Liz had mentioned my name to Glyn so he got in touch and I headed over in secret to meet Penny while Liz was at work. 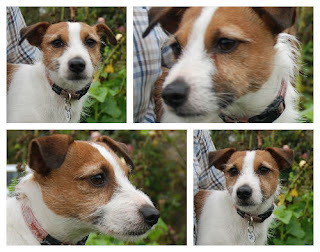 She wasn't a difficult dog to photograph, in fact I would say she was a natural! So I had lots of great images to work from, I wanted to capture her gentle yet cheeky character as well as her beautiful eyes. There's quite a funny story behind this one as well. 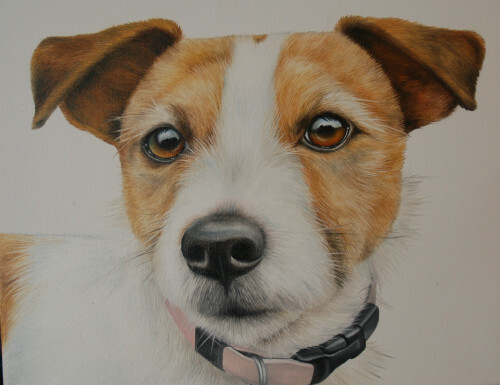 Not long after finishing Penny I got an email from Liz asking me to paint their dog, this was awkward, I couldn't tell her I already had been commissioned in secret by her husband, so was trying to think of what to say without giving the surprise away. Then Liz mentioned it was for a painting of their Spaniel, Kim. I realised then they had more dogs than just Penny, so feeling relieved I agreed to do the painting of their Spaniel Kim as a surprise Christmas present for Glyn. It was beginning to get quite a tangled web! Thankfully I was able to deliver the painting to Liz at her work, so neither would suspect a thing. I would have loved to be a fly on the wall on Christmas day when they exchanged pressies, obviously their daughter knew and found the situation quite amusing!